Microsoft's Windows Mixed Reality technology hit the shelves five months ago and the signs aren't good: dropped by retailers and ignored by developers, Redmond could be facing another Windows Mobile moment. Unveiled in October 2016 and making it to market a year later, early reviews of the devices were so-so, with little to differentiate the machines from competitors Oculus Rift and HTC Vive. The party trick of Microsoft's devices - which run on hardware made by the likes HP Inc, Lenovo, Dell and Samsung - is technology built into the headset that removes the need to set up a network of movement tracking sensors. Microsoft boss Satya Nadella had named mixed reality as one of three areas he wanted to focus on in the future (the other two being AI and quantum computing). But the "mixing" of reality afforded by the headset cameras has yet to make much impact outside of tech demos. Shortly after launch, the addition of support for the SteamVR store gave access to a ready-made library of Virtual Reality (VR) games already developed for the Oculus and HTC idiot visors. However, sales of the Microsoft's version have clearly set neither the real nor virtual worlds alight with major US retailers trying to shift the devices at less than half the launch price. The HP product, which launched at $449 with controllers, can be found languishing on the digital shelves of Amazon.com for $222. Similarly, the Dell Visor has slipped from the same starting price down to $253. No official market stats are available, however, there are signs that sales haven’t gone that well in the UK either. When asked for comment by El Reg, the PR team of the bricks-and-mortar retailer demonstrated the breadth of knowledge for which PC World employees are renowned, saying only that "we can confirm that Currys PC World don’t currently stock Microsoft mixed reality headsets". Without doubt, the drop of the price of the Facebook-backed Oculus Rift to $399 just as the Microsoft hardware launched was somewhat of a spoiler. A lack of software in the lacklustre Microsoft Store and a confused message did not help matters. Consumers were baffled – what was Mixed Reality? Answer: just another Virtual Reality (VR) headset. And developers stayed away in droves. But there remains little love for the immersive headsets, despite enthusiasts pointing at improved resolutions (with the expensive Samsung Odyssey a notable example) and a lack of cables and sensors when compared to the competition. 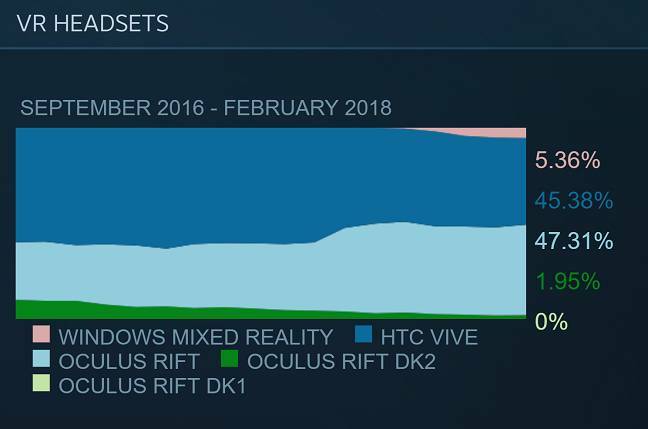 However, the Steam statistics cannot be argued with – Windows Mixed Reality continues to stumble along with a single digit percentage of the market. It is all feeling a bit familiar, just in a slightly compressed timescale. It took perhaps a few years too many before a sad faced Microsoft engineer finally led Windows Mobile around the back of the barn. Even with an improved version of the "Cliff House" software hub due in the next Windows 10 update, it surely cannot be long until the grim reaper engineer arrives again, and focus turns back to the more business-orientated HoloLens.